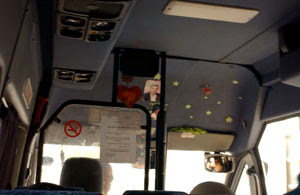 The service taxi on the way to Bethlehem from Jerusalem, it is separate and smaller than the Israeli buses that take you around the cities. 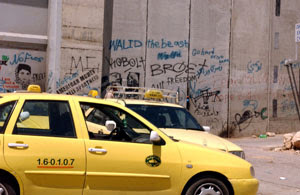 There are Arab drivers with ID's, many times the Israeli soldiers stop the service taxis to check the occupants ID's. Sometimes, they take those off of the service if they do not have the proper ID and arrest them taking them to a jail in an army jeep. Most of the time, the person who was picked up by the soldiers, cannot have legal representation, make phone calls and sometimes is not told why they are taken. The families search for the person, but unless they have connections, they cannot find out where he/she is. Even if they do find out where they are, they are not allowed to visit or talk to the prisoner. 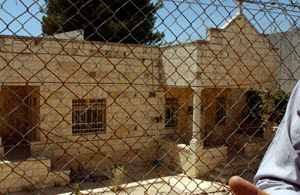 This is a settlement located just outside of the Bethlehem checkpoint called "Gilo" most of the homes are empty. It is located on a hill. I saw an advertisement to buy/rent an apartment from the "luxury tower" it is the tall building located on the left of the settlement. Most settlements are built in circles, on top of hills. It reminds me of the Italian walled in old villages that are speckled throughout Tuscany. 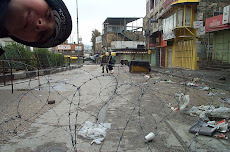 This is the first entry into the checkpoint, and the last photograph that I could take until outside of the checkpoint area. This door is where each person must enter and sometimes, the door on the right is closed, creating smaller space to enter and exit. Both people exit and enter through this door, and there is not any real order as far as lines, and who goes next, when someone gets permission to approach the Israeli soldiers "stall" or to wait. You may hear a slight grunt, from the soldier, when it is your turn. Sometimes, when inside you can hear the soldiers yelling in Hebrew over the loudspeaker. The first time I went through, I heard a Palestinian woman, screaming and crying, inside the building, most likely inside one o the lines of "closets" that are inside of the building. They are small rooms with doors and no windows. I think that they are "holding" rooms for transportation of the person. The person is in there alone. 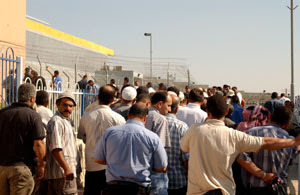 Here is the waiting line during rush hour to get back into Bethlehem after a day's of work. The people never know when they attempt to exit to go to work in the morning, if they will be denied. 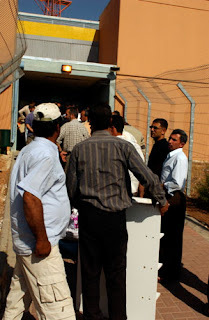 I did not take photographs inside of the checkpoint building, because I did not want my camera to be taken away. Once inside, there are bullet proof windowed stalls lined in a row, and not all are in use. For rush hour they may open two. When inside, there is not really a line and people are pushing through to get near the front. Only one person at a time can enter, they must first show their permit pressing it against the window, and then hand through a slot (like at a gas station stall) the ID, the soldier, puts the ID number into a computer and tells the person if they can continue or not. Then, the person must go through a turn style, and place the right palm of his/her hand on a machine that has rubber nails in a row, where you place your fingers in between while pressing the palm of the hand down for hand printing. (This procedure occurs when leaving or coming back) once they take their palm print, they are given permission to continue. Once you enter into Bethlehem, you walk along the wall (on the right) and a fence on the left. 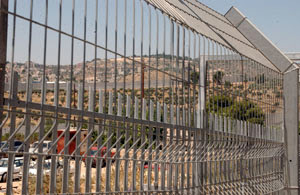 Once you enter into Bethlehem, you walk along a fence that leads you to another turn style, into a parking lot (where cars do not park, but tourist buses drop the tourist off, and pick them up) and then through another gate past a guard, and then down along the wall and a fence into Bethlehem. 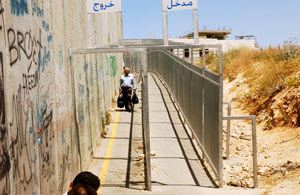 There is a dividing fence once you cross the all to enter into Bethlehem, this man is coming into Bethlehem. It is hard to transport goods inside because you are on foot. To your right is where you need to exit. Graffiti on the wall near the checkpoint and the taxi area, the square in between the two chairs was a scene of nature and blue sky. Taxis waiting for customers just inside the checkpoint. 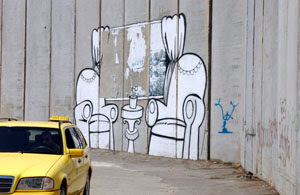 Bethlehem's economy is falling into poverty levels. 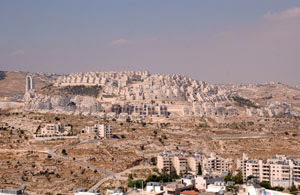 Many people lost their jobs in the surrounding area in Jerusalem (15 minutes away). Many people cannot get their work permits renewed and are denied exiting Bethlehem. The taxi drivers wait outside for an average of 15-20 tourists who walk in each day. They will offer 30 nis (10 dollars) to drive the tourists around to the sites and for them it is a good job to find. Fenced in Church just inside the checkpoint, next to the wall, (on the right) the church is now closed and a driver is explaining to me what happened when they first built the wall at the Bethlehem checkpoint. 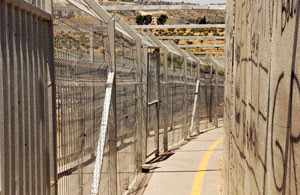 When leaving Bethlehem, you take the same route, however once inside the building, you walk through a series of dividing metal bars to direct your path. There are camera's everywhere. You walk until you see a "green light" over one of the turn stalls (not the half turn stalls, but the tall ones, with roatating bars). When the light is green, you can push on the bar, to turn and enter, when it is red, you must wait. There is only a camera, you cannot see a person. Sometimes they tell you what to do in Hebrew, but because it is over the loudspeaker, the voices become all muffled and you cannot understand what it is that they are saying. So you just wait. I saw a group of tourists wait two hours. You cannot find a person to find out why, or what is going on, you just stand there and wait. When this happened, I went backwards, to ask the soldier, on the other side of the parking lot, who sits inside of a windowed box, why he is letting people in the first gate, if they are closing the second? He told me that it should be open and he would call them. A Palestinian near me said, you can go ask those things, but we cannot. If we do, they will take us to jail, or beat us up because we are not being respectful. Once through the first turn stall, there is a baggage x-ray machine, the Palestinians (not tourists) must take off their shoes, belts, hats, watches, money, cell phones, and put them in the box, and walk through. There is a soldier, that sits inside of a larger stall, bullet proof, without any way to talk to them, and waves you through or not. Once finished, you go through another turn stall, when the light is green, and continue to the stalls to show your ID and take your palm prints before leaving.